Below you can view all the homes for sale in the Belle Isle subdivision located in Georgetown South Carolina. 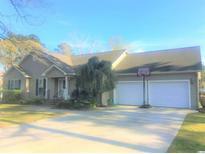 Listings in Belle Isle are updated daily from data we receive from the Myrtle Beach multiple listing service. To learn more about any of these homes or to receive custom notifications when a new property is listed for sale in Belle Isle, give us a call at 843-639-5850. *All measurements and square footage are approximate and not guaranteed, the buyer is responsible for verification* MLS#1908932. *Buyer is responsible for verifying square footage. MLS#1907376. Buyer is responsible for all verification. MLS#1906800. The living room could also be used as an office or a media room. MLS#1905316. Charleston and Myrtle Beach are about an hours drive. A MUST SEE!! ! MLS#1821945. 6 year Home Warranty on home. MLS#1616285.